The ubiquity of security cameras in our world suggests we have become compliant being constantly recorded in public spaces. Yet privacy and data retention are hot topics and have made designers very much aware that their design choices affects what kind of data society we will become. In this current context, a growing group of designers worry about the dark side of automated data recording. This project explores ways in which recording data in public spaces can be used in a positive, constructive and privacy-respecting way, to the benefit of the users of that space. We hope it can function as an antidote to the current (necessary, but often negatively framed) discussion on automatic data recording in public space. The idea of a room that listens and plays back snippets of spoken word is an extension of current trends in public events. Many are showing what people at the event are thinking about through hash-tagged Twitter messages and Instagram photos. An actively listening space can show the general mood of those inside, show changes in topics discussed over time, and spark new conversation. This could be an interesting application for events like conferences, galleries and fairs. Whenever people enter a new space, there is curiosity to know what is happening, at that point of time as well as what has happened before. This installation is meant to provoke the audience and to think: how can a space be used to inform those in the space about what is happening in it over time, to give it a way to tell a story about itself? Our interactive prototype gave visitors a sense of what it is like to have the room eavesdrop on your stories, and feeding back little snippets of it. 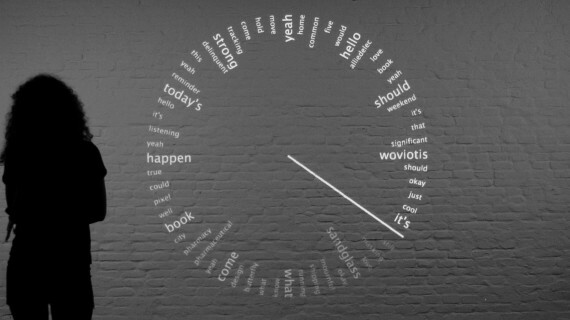 By displaying words from the past hour on a clock face, the audience could gauge the vibe of a place: what had been talked about, were the words more positive or negative? Since the single words that are overheard are not directly linked to the other words or to the people in the room, visitors do not have to worry about their privacy. The challenge of the project was build a proof of concept in less than a week, so we relied on readily available hardware. This turned out to be a fruitful limitation, as the system we build can now easily be recreated by anyone with access to any combination of computers, tablets, microphones and projectors. We have the following suggestions from people planning to build their own version. Based on our experience during the exhibition, a good directional microphone improves the accuracy of the words deciphered. The projection screen with the recorded words of the past hour was highly appreciated by the visitors, as it allowed them to connect, point and discuss the meaning behind in the displayed words. We noticed how different people responded to the installation and saw parallel contexts where it could be interesting. Though it was meant for public context, people saw potential for something like this in private spaces like home etc. 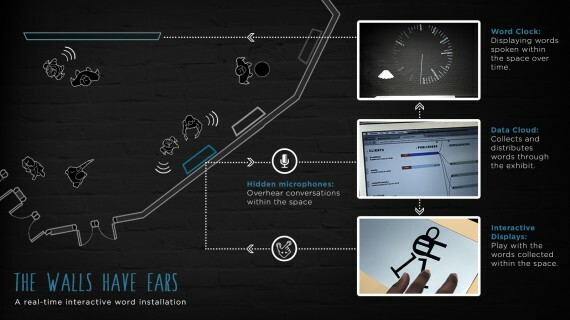 The starting point for the interactive installation was the notion that widely available technology can now make spaces aware of what is going on inside them. We used standard hardware materials for our system: tablets, computers, projectors and a WiFi network to connect them. These materials were chosen for two reasons. Firstly, they allowed us to quickly prototype the experience, building the behavior of each device with Processing and connecting them using Spacebrew. Secondly, standardization and wide availability of this hardware means the system is very scalable and can easily be recreated and improved on by others.